The Evolution of Measurement is our brand promise. The company has been established in 2007, as a spin-off company from the Tewati Group, at Department of Optics and Quantum Electronics, University of Szeged. Our products are related to ultrafast laser diagnostics, dispersion measurement and control, including frequency comb and carrier envelope phase. We are located in the city of Szeged, which excels at optical and laser sciences in higher education and academic applications, including several institutions and departments of the University of Szeged as well as the Biological Research Centre. Furthermore, Szeged hosts the soon-to-be-completed attosecond laser facility, ELI-ALPS. Laser technology researches conducted at the University of Szeged are based on decades of scientific tradition and scholarly professionalism, and the research laboratories are equipped with internationally outstanding infrastructure. The two terawatt peak power titan- sapphire laser system (TeWaTi) which is unique in Hungary, the internationally acknowledged High Intensity Laser Laboratory (HILL), and the ELI-ALPS ‘superlaser’ which will be implemented in Szeged as a European Union common research infrastructure of a 200 million EUR investment altogether provide excellent technical facilities for future researches. Spatiotemporal compression and carrier-envelope phase stability of ultrashort pulses are among the most important issues of chirped pulse amplification (CPA), the most common method to achieve high intensity laser beams. Successful shaping of the temporal envelope and recombination of the spectral components of the broadband pulses need careful alignment of the stretcher-compressor stages. Several diagnostic techniques have been developed so far for the characterization of ultrashort pulses. Some of these methods utilize nonlinear optical processes, while others based on purely linear optics, in most cases, combined with spectrally resolving device. Generally, CE Optics Ltd. provide a solutions based on the latter category of the ultrafast diagnostic methods. We utilize the exceptional precision and almost requirement-free properties of spectrally resolved interferometry. Due to wavelength independence and scalability, our products are easily customizable for your needs. Please browse our scientific publications to find examples of applications. This specialized research team was established at the end of the 1990’s at the Department of Optics and Quantum Electronics at the Faculty of Science and Informatics. Its activity is based on Szeged’s tradition of laser research, and it is nowadays the centre of Hungary’s femtosecond scale, high intensity laser research. The main experimental device is Hungary’s only titansapphire laser system, the so called TeWaTi laser that produces close to 2 terawatt peak power pulses. The TeWaTi Laser and Research Group’s scientific activity, which is supervised by Dr. Károly Osvay, is strongly connected to the scientific and technological development of the European research infrastructure, the ELI-ALPS (Extreme Light Infrastructure – Attosecond Light Pulse Source), which is to be built in Szeged, and also to the research to be conducted there. The Research Group has great achievements in the fields of measurement and diagnostics. They developed extremely accurate methods to measure material dispersion, including the measurement of the dispersion of air, neutral gases, biological materials, and optical fibres among many others. Based on their research results in the field of linear interferometry, they developed measurement methods for the temporal and spectral diagnostics of few-cycle laser pulses, including the determination of angular dispersion, and the measurement and stabilization of carrier envelope phase. 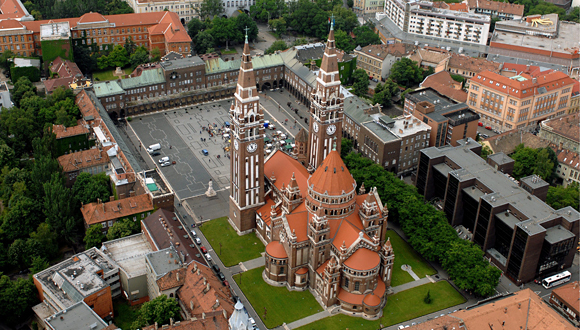 Among the planned and ongoing projects of the scholars of Szeged, it is worth mentioning the study of ultra-fast switching of proteins, which they conduct in cooperation with the Biophysics Institution of the Biologic Research Centre of Szeged; the measurement of the transient absorption of light-sensitive medicaments; and also the ultrafast, time resolved research on the of laserlight- induced ablation of the surface of materials. Attosecond pulses can be produced by nonlinear processes generated by high intensity femtosecond laser pulses. The researchers develop methods for increasing the efficiency of the generation as well as for the temporal and spectral characterization of the attosecond pulses. During the experiments laser pulses that are different from the provided primer lasers often have to be used, so the variety of available laser pulses in the TeWaTi lab is constantly extended and their parameters are continuously developed, according to the researchers’ experience in the fields of generation, amplification and frequency conversion of laser pulses. The most outstanding results of the past five years are the new methods developed for the isochronic tuning of the carrier envelope phase of short pulses, and the two registered international patents based on them. The high-accuracy measurements of the linear refractive index of bacteriorhodopsin, and of the linear and non-linear refractive index of neutral gases are also worth mentioning. The research team’s professionals have also generated femtosecond light pulses in the green spectral range, which is not possible to reach directly by laser. This result is absolutely unique in the field of light source development.